Author’s Note: Click here for a 2011 county-by-county loan limit list. Conforming mortgages are appropriately named; they “conform” to the mortgage underwriting guidelines of Fannie Mae or Freddie Mac. Mortgages meeting these criteria are securitized on Wall Street as mortgage-backed bonds. Since 2007, though, as mortgage performance weakened, Fannie and Freddie’s lending standards tightened. Today’s would-be borrowers must document more income, hold deeper reserves, and show higher credit scores as compared to recent years. One underwriting area that hasn’t toughened, however, is the maximum loan size. Click here to get a conforming mortgage rate quote (Apr 20th, 2019). 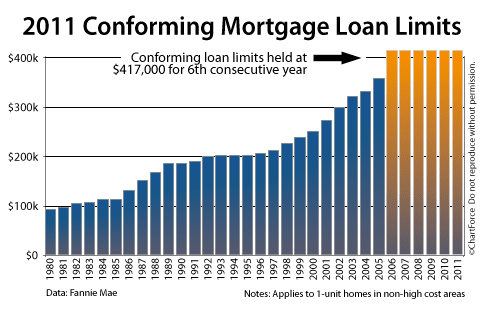 In 2011, for the 6th consecutive year, the 1-unit conforming mortgage loan limit is $417,000. The classification “1-unit home” stands for a single-family residence — either detached, condo, rowhome, or townhome. Anything over 4-units is considered a commercial property and cannot be originated through Fannie Mae or Freddie Mac. Note, though, that these maximum conforming loan limits are just a starting point. The actual loan limit varies by market. Not every home is subject to the $417,000 Fannie Mae loan limit. Some homes — specifically those in “high-cost areas” — are granted loan limit exceptions that range all the way up to $729,750. “High-cost” is defined by the median sales price of a region. The expanded loan limits help homeowners in places like Loudoun County and Alexandria, Virginia, for example. Homeowners don’t have to take “jumbo” loans because their respective mortgages exceed $417,000. Instead, they get the same low mortgage rates as the rest of the country. The same is true for homeowners in Bethesda, Potomac, and the rest of Montgomery County, Maryland. Click here to check your local conforming loan limit. But, just because a city is “expensive”, that doesn’t make it “high-cost”. Take Chicago. From Waukegan (north) to Calumet (south), and Joliet (west) to Lake Michigan (east), Chicagoland’s prevailing loan limit is $417,000. This is because the government lumps the entire region into a single metropolitan statistical area and — across that area — the median home price is just “average”. For places like Lake Forest, Gold Coast, Lincoln Park, and Hinsdale, therefore, the conforming loan limit is stuck at $417,000. There are 197 designated high-cost areas in the U.S., representing just 6% of the country. Mortgages that exceed the local loan limit are often called “jumbo” or “super jumbo” mortgages. The good news is that jumbo and super jumbo mortgages are plentiful right now and the pricing is excellent — you just have to know where to look. The best places to find jumbo and super jumbo mortgages right now are niche banks and portfolio lenders. They’re giving low rates with loose LTVs. The key to eligibility is to have documented income and better-than-average credit scores. Jumbo mortgage rates are as low — or lower! — than their conforming mortgage cousins. It’s because of how jumbo mortgage rates are made. The window probably won’t last long, however. As the economy expands, the forces that make jumbo mortgage rates low will disappear and rates will rise. If your mortgage too big for local conforming limits and is jumbo or super jumbo, click here to get a jumbo mortgage rate quote. I lend in most states and can send you rates today.